Today we learn how to configure connections and execute SQL queries. You may see the configuration file path in the status bar. 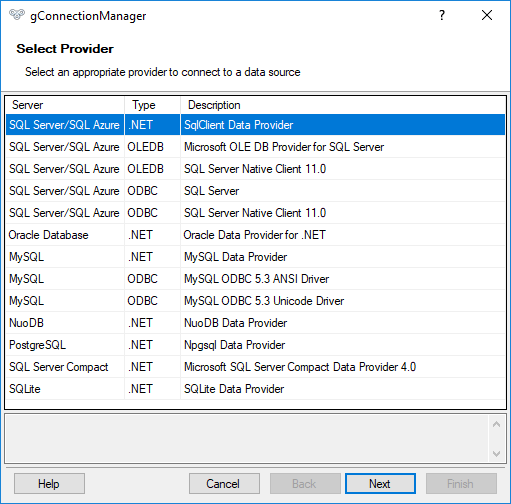 Select, for example, SqlClient Data Provider to connect to Microsoft SQL Server and click Next. In this step, specify a server, database, and your credentials to connect. You may click the Examples link to get connection examples. Select your existing database and click Finish. Rename the string. 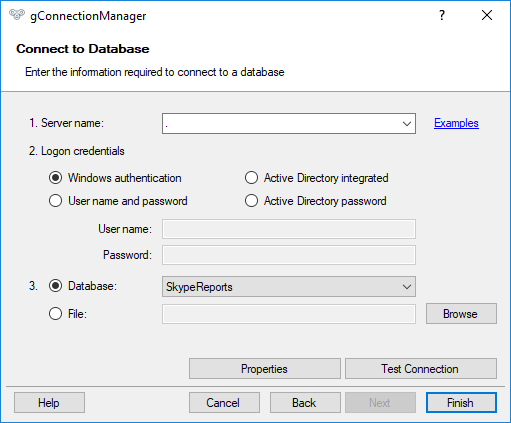 In this example, it has a name as the connected database, SkypeReports. Click the Save button and close the wizard. In this example, you may see a created connection string in the user configuration file. There are three configuration files available: AppConfig, UserConfig, and LocalConfig. Use gsqlcmd localconfig to edit connection strings specific to a folder. Now, let's execute the query against the created connection. Type, for example: gsqlcmd SkypeReports "SELECT 'Hello, World!'" Let's export data to CSV using the /ascsv option. Today you have learned how to create named connections and execute SQL queries. You may use the same technique for any supported database platform. You may easily export data to CSV. Just add the /ascsv option.